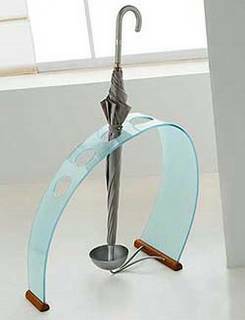 I didn't know I wanted an umbrella stand until I found the Flipper. Let me clarify here: I don't need an umbrella stand. I only own one umbrella, and it's a compact model that's only about a foot long, so it wouldn't even fit in an umbrella stand if I had one. I don't have one, because I don't need one. But I still want a Flipper, in the worst way. The Flipper has me going for a few reasons. First, it just looks really cool. Second, the shape reminds me of a rainbow and the frosted glass reminds of of water, so it has the karma of something related to an umbrella. Third, it manages to incorporate wood, glass and metal into a minimalist but funky design. Fourth, fifth and sixth, it looks really cool. There isn't a pot of gold at the end of this rainbow, though, but it will cost you one if you want to buy it. A pot with $687.50 in it, to be exact. I guess I'm going to keep not having an umbrella stand for a long time. It's also pretty damn cool because all the tips rest in that little water collection bit. Also available from me for $76.50. But I do have to agree...that water holder is slick. Somebody was really using his noggin here.